ST. LOUIS, Jan. 12, 2017 /PRNewswire/ -- Junior Achievement's (JA) St. Louis BizTown is now "pet friendly" thanks to a new Purina storefront where students can learn what it's like to be a veterinarian, veterinary technician, nutritionist, as well as, how to be a responsible pet owner. JA BizTown in Chesterfield, Missouri, is a mini storefront city where fifth and sixth graders discover how the "real world" works by learning about economics, personal and business finance, entrepreneurship and philanthropy. The students run simulated businesses for a day while interacting with others in their respective employee roles. "Purina is excited to share our passion for pets with students and provide inspiration for pet-related careers," said Steve Degnan, Chief Human Resources Officer at Nestlé Purina PetCare. "Our new storefront at JA BizTown supports a global Nestlé initiative called Project Opportunity, which focuses on job preparedness, apprenticeships, veteran transition to civilian jobs and other issues related to finding employment. As these students get older, we believe this experience will encourage them to consider pet-related careers and make Purina one of their top choices for employment." Purina's new Pet Adoption Center storefront at JA BizTown allows students to have a variety of pet-related experiences – from pet owner to veterinarian. Students can "adopt" a plush toy dog or cat through a simulated Petfinder.com website. The pet, which is microchipped to demonstrate the importance of proper identification, plays a role throughout the experience at the Pet Adoption Center. 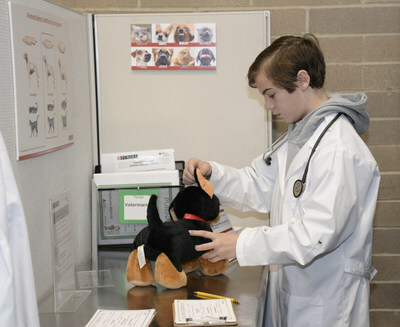 Students working as veterinary technicians and veterinarians perform a pretend medical exam and make Purina food recommendations based on the pet's profile, which includes their life stage and weight. Each student takes a pledge to be a responsible pet owner before taking home a mini plush version of their new pet, giving them a glimpse of the responsibility that comes with being a pet owner. Students can also play the role of nutritionist as they conduct an interview for the BizTown TV station about the role quality ingredients play in pet food. "The Purina storefront has been very popular," said Lori Jacob, JA President. "JA BizTown reaches nearly 13,000 students annually, and we're thrilled that we can incorporate pets into our mini city and promote responsible pet ownership along with potential careers in a pet-related field. Purina has put a lot of effort into making this educational experience meaningful and relevant to the students' future." For information about visiting JA BizTown, visit www.JASTL.org. Junior Achievement of Greater St. Louis inspires and prepares young people to succeed in a global economy. Founded in 1919, with a presence in Greater St. Louis since 1943, Junior Achievement encourages confidence, and motivates young people to achieve their personal, educational and career goals through a range of programs led by volunteers from the business community. The organization served more than 153,000 students in the region during the 2015-2016 school year. For more information, contact Lori Jacob, President and CEO of Junior Achievement of Greater St. Louis, at (636) 728-0707 ext. 200 or by email at ljacob@jastl.org. Additional details about JA may be accessed online at www.JASTL.org. Nestlé Purina PetCare promotes responsible pet care, community involvement and the positive bond between people and their pets. A premiere global manufacturer of pet products, Nestlé Purina PetCare is part of Swiss-based Nestlé S.A., the world's leading nutrition, health and wellness company. To learn more about Project Opportunity and career opportunities at Nestlé Purina, visit www.nestlepurinacareers.com.